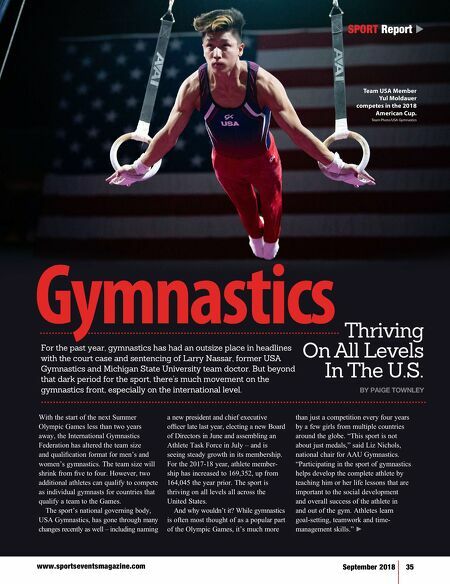 www.sportseventsmagazine.com September 2018 35 Gymnastics Thriving On All Levels In The U.S. BY PAIGE TOWNLEY With the start of the next Summer Olympic Games less than two years away, the International Gymnastics Federation has altered the team size and qualification format for men's and women's gymnastics. The team size will shrink from five to four. However, two additional athletes can qualify to compete as individual gymnasts for countries that qualify a team to the Games. The sport's national governing body, USA Gymnastics, has gone through many changes recently as well – including naming a new president and chief executive officer late last year, electing a new Board of Directors in June and assembling an Athlete Task Force in July – and is seeing steady growth in its membership. For the 2017-18 year, athlete member- ship has increased to 169,352, up from 164,045 the year prior. 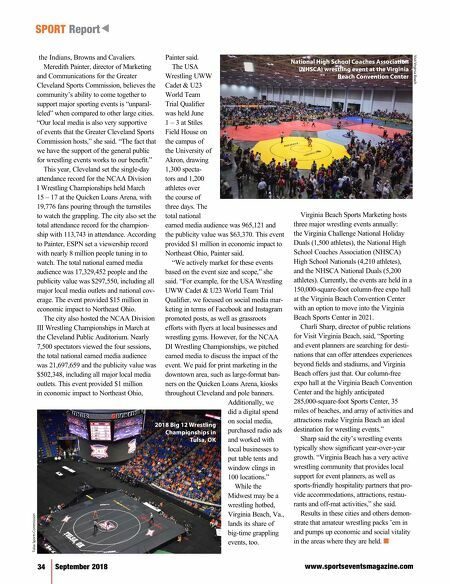 The sport is thriving on all levels all across the United States. And why wouldn't it? While gymnastics is often most thought of as a popular part of the Olympic Games, it's much more than just a competition every four years by a few girls from multiple countries around the globe. "This sport is not about just medals," said Liz Nichols, national chair for AAU Gymnastics. "Participating in the sport of gymnastics helps develop the complete athlete by teaching him or her life lessons that are important to the social development and overall success of the athlete in and out of the gym. Athletes learn goal-setting, teamwork and time- management skills." ► t SPORT Report Team USA Member Yul Moldauer competes in the 2018 American Cup. Team Photo/USA Gymnastics For the past year, gymnastics has had an outsize place in headlines with the court case and sentencing of Larry Nassar, former USA Gymnastics and Michigan State University team doctor. But beyond that dark period for the sport, there's much movement on the gymnastics front, especially on the international level.